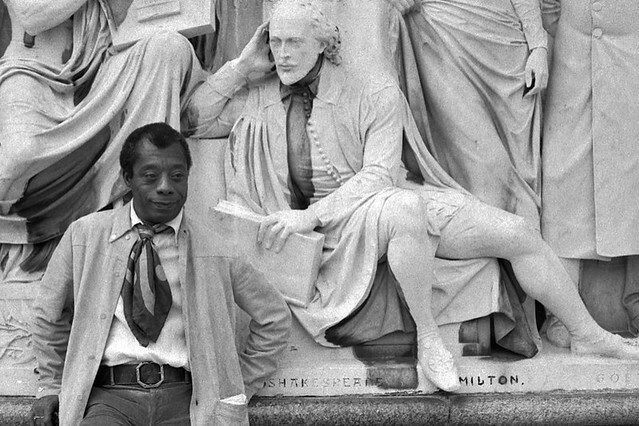 James Baldwin on the Albert Memorial with statue of Shakespeare. Photo Credit: Allan Warren. Our North American society is at an impasse, and the question of how to live on is palpable. But we struggle to speak it, to find words, to give voice among the clamor and to be heard. Our fantasy of the good life, safe from the other, is killing us; we are killing each other. The stories we tell about ourselves are increasingly unstable, the relations between persons and the relations between worlds are changing in ways that are impossible to understand yet, and our ideas for how we might live together are in crisis. Is “this time,” this impasse, going to be different? Or will we settle back into the familiar, foregoing the possibility of anything otherwise, for the fundamental reason that we refuse to love one another? Love is labor: the work of sacrifice, struggle, difference, failure and (maybe) mercy. It is the only ethical – possible? – response to this impasse; where else would we get our energy to live any differently? It is also the most pragmatic option – immanent within each of us, imminently actionable. Any meaningful end to police brutality, any meaningful life alongside our Muslim brothers and sisters, any meaningful de-escalation of firearm ownership, any meaningful home for refugees from overseas, any meaningful change in our relationship with our environment starts (and ends) with love. A word from the Editor: As we reach the end of 2015 and continue to see crises upon crises mounting both in the US and abroad, CoLab Radio invites readers and contributors to pause and reflect on the theme: Love in These Times. We invite you to submit a post surfacing sage insights around love that inspire you and that might offer hope in our current moment. Insights might be an excerpt from a book, a meditation, a poem, a short video excerpt, an image etc. Please include a short reflection (300 words or less) on the piece. You can make your submission here.